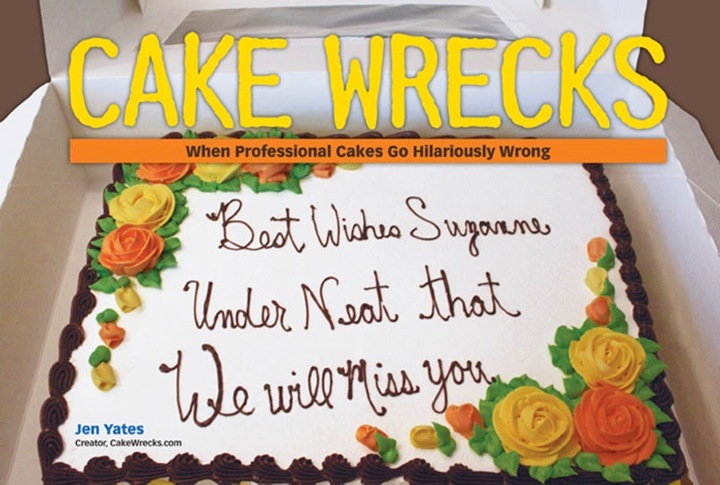 Cake Wrecks - Home - Sorry, Mario! Your Cake Wreck Is RIGHT HERE. When Allison H. sent this inspiration photo to her baker, her baker assured her she could "replicate it exactly." As it turns out, though, Allison and her baker MAY have different definitions of "replicate" and "exactly." And that's why you should never do 'shrooms, kids - unless you know how to cover them in fondant. One cake makes you happy. And one cake makes you bawl. Don't pay anything at all. 'Cause they've seen 'em all. 'Cause they'll post them all. At least the photo paper isn't a photo of the original cake. I don't know what the customer paid for that cake, but she should get her money back, plus extra for pain and distress. @Catherine. Thank you for reminding us that this actually could have been even more wrecky. Perhaps that would have been more forgivable, considering she would have at least followed through on the "replicate" part. Sorry, Zuzu--no angel got their wings this time. Today's challenge: Finds the Differences. Can you find the 436 differences in today's almost identical cakes? @ Sharyn - Best. One. Yet. Well the wreckerator DID actually use fondant on the mushroom. But my 7 year old could have made that shroom look more professional. Who could present this to a customer and expect payment? I think my favorite (or least favorite) part is that the mushroom colors are inverted. Supposed to be a red cap with white spots and the wreckerator somehow did a white mushroom cap with red spots. Just... wow. How appropriate that my youngest and I played Mario Kart on the Wii yesterday. I had the defective controller. Yup! That's my story and I'm stickin' to it! When I look at that wreck all I can hear in my head is my daughter laughing and yelling at me to "Press B, Mom! Press B!" p.s. I can't be the only one that double checked to see if they actually spelled birthday right can I? @Catherine, That is such a good point! Is it bad that I sort of want to see that happen, though? And that poor mushroom. It just looks so sad. A sort of "Please, end my misery" look. Instead of replicate, it should have been (best Dalek voice) "EXTERMINATE!" That's so sad - even I could do better and I'm rubbish at decorating cakes! @SaraCVT: That's what I thought of when I saw the name Zuzu! I think the baker did exactly what she said she would...didn't she say she would wreckplicate the Mario cake? Nailed it! Long time viewer, first time poster. Sharyn, you knocked it out of the park - again. I am laid up with a seriously broken ankle (as opposed to the fun ones..?) and you folks are a big part of my PT. laughing really gives the muscles a work out. As far as the Wreckerator goes, I have this malicious urge to throw something else at them, just to see what they come up with. I need the work out. So, was the baker trying to do it completely from memory? Unbelievable. It's been a long time since my mouth has dropped open and stayed that way for as long as this wreck made it! Wow! September 23, 2013 | Laura P.
I wonder if they get so perturbed by people giving them inspiration cake pictures and not allowing them to make their own creative choices that they just bomb the cake out of spite. "I am the baker! I am an arteest! Do not ask me to recreate someone else's cake! Patooey, I spit on their cake! Therefore, I will be using my own (artistic) license in the interpretation of their pathetic inspiration cake. Bwahahaha! Mine is an evil laugh!" The customer's reaction? "Curse your sudden but inevitable betrayal!" What the... the baker is so inept that s/he even reversed the colors on the mushroom cap. This cake is obviously from Bizarro world. Sharyn: love love love it! One of my fave songs of all time! Glad the trolls took the day off. You know, "you get what you pay for," "buttercream can't do what fondant does," yada, yada, yada. Fondant can't do what buttercream does (namely, taste awesome), so there. his comfy recliney - Ah! Are you sure you didn't post the same picture twice? I keep staring back and forth from one to the other and I can't find a pixel's worth of difference. Sharyn, you've outdone yourself once again! You amaze me. @Sharyn: Another awesome song! I am impressed that you know enough of the words to "White Rabbit" to be able to parody it. And speaking of which: I think this wreckorator must have been interacting with some of those infamous mushrooms or pills. Because I can't think of another explanation for this final result. Totally off subject, but too bizarre not to share: the Youngest Daughter and I were just speculating on what zombie poop would look like. Hey, if they eat, no matter their diet, they gotta poop--it's logic. Now where would they go...? Daughter thinks behind a tree is "GRO--OSS! ", apparently grosser than eating brains and dripping decaying flesh. Who can fathom the tween mind? Maybe the wreckerator thought they only wanted the lettering style replicated. I mean seriously if you're gonna go the lazy route, AT LEAST try hiding the seam D: Is that so much to ask!? Maybe it's an allegory for the ugly duckling? Only its the Ugly Mushroom? To show Zuzu that even the ugliest of mushrooms....PROBABLY tastes good? Or poisonous... cause the mushrooms in Mario actually look like Deathcaps (Amanita muscaria) xD...maybe the baker was trying to keep Zuzu from EATING mushrooms that looked like these? It's okay depressed mushroom....I'll still eat you. AND THEN GROW GIANT! MUAHAHAHAHA! @Jodee: Hey! I always seem to get the malfunctioning controller, too! @BeckyG: Here's hoping your ankle heals up quickly, and that when it does, it looks better than that poor wonky mushroom! @Craig: Teehee! Your mind, it is devilish. I like it. @SaraCVT: Of course! Zombies may eat brains and never bathe, but they certainly use the toilet and wash their hands after, I'm sure! Looking back on myself at that age and looking at my two boys when they were that age, I think tween brains vibrate at just the right frequency to enable alien possession. Once they turn, oh 16 or 18, they begin to return to normal and alien occupation is impossible. I completely believe my first haiku was eaten by the internet, so I did a variant on it since I couldn't remember the original exactly. So two versions for the price of one!